The widely ballyhooed Gateway project to rebuild and expand New York's Penn Station is just a "Gateway to megadebt," according to an opinion piece by Paul Mulshine in the Star-Ledger (April 13). Mulshine took a walking tour of midtown Manhattan with retired Long Island Rail Road executive (and Lackawanna Coalition member) Joe Clift, and said he learned that the problem with Gateway, as well as its predecessor Access to the Region's Core (ARC) is pork -- political pork barrel, not the kind served at Brother Jimmy's BBQ, a Manhattan restaurant that is located on a Manhattan city block that would have to be razed -- all 64 real estate parcels -- if the full Gateway expansion were to happen. We need tunnels, but the tunnels are only a small part of the total expenditure for Gateway, $24 billion and likely to increase, say Mulshine and Clift, once the project attempts to acquire those parcels. What we need to do is to go back to the original 1995 tunnel plan before ARC got politicized and trimmed down to a deep-cavern station 180 feet deep near Macy's. And the original plan would have gone beyond Penn Station with tunnels to Grand Central Terminal, an underutilized facility on the East Side of Manhattan -- where many commuters want to go. Where will the money come from for Gateway? Recent developments in Washington show that the Feds are backing away from their commitment to all new transit projects, including Gateway; and as for New Jersey's half of the project, "we're broke," Mulshine writes. A third, single-track tunnel would only cost "a couple billion bucks," said Clift, and would provide an alternative for train traffic while the crumbling, hundred-year-old tunnels can be rehabbed. Later could come a fourth tunnel and maybe that connection to Grand Central. "Or," Mulshine writes, "we could just keep loading up the Gateway project with pork and hope The Donald sends a big check . . . that could happen . . . but pigs will fly before it does." If you think New York's transit situation is bad, it will only get worse, if infrastructure continues to be neglected. That's the theme of an opinion piece in the New York Times (April 11) by the U.S. senators from New York and New Jersey. In the column, Sens. Booker, Gillibrand, Menendez, and Schumer warned that if we don't act "soon" to repair the aging and flood-damaged tunnels under the Hudson, the recent chaos due to a train derailment (see article below) will become "a permanent reality." They then go on to describe Amtrak's Gateway project, which would include two new tunnels along with many other improvements. The senators warn that key Federal funding sources needed to implement Gateway would be slashed in the budget that President Trump has proposed. Gateway is important, the senators added, but is only "an illustration of the country’s immense need for infrastructure investments." They contrasted the President's stated commitment to massive infrastructure investment, but lack of specifics and budget cuts instead, with what they said were Democrats' actual plans to invest in the country's infrastructure. If the budget proposals go forward, the senators warned of a "hair-raising transit apocalypse" to come. The Lackawanna Coalition is dubious that funding can be secured for the very expensive Gateway project; the essential component is the tunnels, which can be built for a fraction of the total cost of Gateway; only one single-track tunnel would avoid the "apocalypse" the senators envision. Two tunnels, of course, would be better, if the money can be found. Service returned to near-normal on Friday, April 7 after four days of disrupted service on all three rail carriers using New York's Penn Station. The chaos started around 9 a.m. on Monday, April 3, when an NJ Transit inbound train derailed while entering the station. Later in the week, Amtrak determined that the cause was "misaligned rails" at a critical switching point, and blamed the defect on deteriorated crosstie timbers beneath the rails. Amtrak, which owns and maintains the station complex, said it had been aware of the deterioration, but hadn't appreciated how serious the problem had become; Amtrak vowed to re-inspect all of its Penn Station trackage. Amtrak's analysis was reported (April 7) by Emma G. Fitzsimmons and Nick Corasaniti in the New York Times; they said the deteriorated timbers allowd the rails to spread and the train's wheels to drop between the rails. Amtrak had hoped to complete repairs in time for the morning rush hour on Friday, but work continued for several hours, causing delays and cancelation of 14 trains on the Long Island Rail Road Friday morning. By the evening rush on Friday, apparently all tracks were opened and service was close to normal. As a hedge against possible continuing problems, NJ Transit announced that cross-honoring of tickets with PATH and ferries would continue through 3 a.m. on Saturday, April 8. The incident was an eerie reprise of the Amtrak derailment on March 24 (see story below). In the April 3 incident, inbound NJ Transit peak-hour Northeast Corridor train 3926 derailed at low speed while negotiating its entry into Track 9 at New York's Penn Station. Three cars of the train derailed around 9 a.m., and at least five of the 1200 riders were injured, although reportedly none of the injuries were serious. The train, one of the fastest runs on the railroad, runs nonstop from Princeton Junction to Newark. The two events in less than two weeks were bound to raise speculation that the rail infrastructure was becoming unreliable. By Thursday, both New York's MTA and NJ Gov. Christie were criticizing Amtrak for poor track maintenance, with Christie issuing a letter to Amtrak suspending NJ Transit's payments to Amtrak for use of Amtrak's Northeast Corridor tracks, and even asking his attorney general to claw back NJT's past payments, pending a "thorough and independent examination of track, signals, switches and other equipment maintained by Amtrak." But New Jersey commuters were reportedly blaming Christie's cutbacks in NJT's funding and his general lack of attention to transit issues for what they see as an increasingly rickety system, whether or not Amtrak bears responsibility for the chaos the week of April 3. To cope with the reduced station capacity, for four days NJ Transit ran its Northeast Corridor and North Jersey Coast Line trains on a "enhanced holiday" schedule, with far fewer trains in peak hours. Morris & Essex and Montclair-Boonton line "Midtown Direct" trains were diverted to the railroad's Hoboken terminal, where acute crowding resulted, aggravated by restricted access corridors owing to ongoing repairs after a September 29 crash of an inbound train that closed the principal walkway to the connecting PATH rapid transit system. A bystander in the station died in that incident. Long Island Rail Road canceled peak hour trains all week, and Amtrak modified its Northeast Corridor, Keystone, and Empire Service schedules. Reporting by Emma G. Fitzsimmons in the New York Times (April 5) said that by Tuesday, a "relatively minor mishap" had "casdaded into a transportation crisis, snarling travel up and down the East Coast, upending the lives of thousands of people, and vividly illustrating the fragile state of infrastructure in the nation's busiest transit corridor." The derailment occurred at a critical switching point, taking eight of the station's 21 tracks out of service; equipment was damaged that would apparently take at least several days to repair. Amtrak, responsible for the track, said it could not predict when repairs would be complete. According to the Times article, "Hoboken Terminal . . . became an extraordinary scene of gridlock as passengers leaving NJT trains struggled to make their way to PATH trains, buses, and ferries bound for Manhattan." Police even had to barricade the stairs leading to PATH to control the mob. Commuters reported increased travel times; one rider from South Orange said it took two hours to reach her job at NYU. Some riders to Trenton on the Northeast Corridor even paid the $60 Amtrak fare to get home. A "minor" derailment of an Amtrak Acela express train at the west end of New York's Penn Station resulted in a low-speed, sideswiping collision with an inbound NJ Transit train just after 9 a.m. on Friday, March 24, snarling traffic on all three railroads that use the at-capacity station for the rest of the day. There were only a few injuries, all on the NJT train, and they were said to be minor. The outbound Acela was bound from Boston to Washington with about 250 passengers; the NJT train was inbound from Montclair State University and reportedly carried about 1000 commuters. Damage to the last two cars of the NJT train included scrape marks and pushed-in windows on the lowest level of the multi-level cars. The Amtrak train had not cleared the platform and its passengers were evacuated directly onto the station platform; similarly, the NJT train, which may have continued into the station, was emptied of its riders onto the platform. The incident caused NJT and Amtrak traffic to be snarled for the rest of the day; NJT trains did not run for some time after the collision. Eventually, NJT established a modified schedule for the rest of the day, with inbound trains from the Northeast Corridor and North Jersey Coast line running once per hour; a special schedule was published for the outbound evening rush, with about 10 trains schedule to depart between 5 and 6 p.m. Midtown Direct service (on the Morristown, Gladstone, and Montclair-Boonton lines) was diverted to Hoboken, and NJT warned of delays in and out of Hoboken due to the additional traffic. 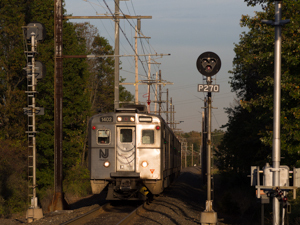 Raritan Valley Line trains operated only to Newark. PATH trains to Hoboken were reported to be very crowded, as NJT passengers sought alternative routings. The other two railroads using Penn Station were also affected. The Long Island Rail Road said it was able to maintain more or less normal service until the evening rush hour approached, at which time it had to implement a severely restricted schedule, since half the tracks in uses in the peak hours were not available. Passengers were advised to use the line's Atlantic Terminal station in Brooklyn to avoid the Penn Station mess. Amtrak ran its usual Northeast Corridor services, subject to delay; but Keystone Service trains to and from Harrisburg were terminated at Newark. Empire Service trains to and from New York State operated only to Yonkers, where Metro-North shuttles conveyed passengers to and from Grand Central Terminal instead of New York Penn. By Saturday NJT was saying that services were back to normal, except for New York - Rahway services which remained canceled, and by Monday (March 27) all carriers were reporting normal service. NJT Can Get You to NY. Then What? The reliability and comfort factors can be debated, but NJ Transit delivers tens of thousands of passengers to New York's Penn Station every day; reportedly, 57,000 NJT riders arrive at New York Penn in the peak weekday morning rush hours of 6-10 a.m. OK, your train arrives at its platform . . . then what? Reporting by Melanie Grayce West and Andrew Tangel in the Wall Street Journal (March 21) has highlighted what riders have known for years: arrival at the platform can be the beginning, not the end, of the struggle. Years ago, when NJT was planning new trans-Hudson tunnels and a new station under 34 Street, advocates lambasted the plan, partly because the "deep cavern" station far below street level would be inconvenient to access, with riders taking 10 minutes or so to reach street level. Gov. Christie canceled that plan, but is Penn Station any better in this regard? Platforms at Penn are narrow, and jammed in peak hours, and sometimes in off-hours as well. Sometimes two trains arrive or depart simultaneously on each side of the same platform; even worse can be the situation when a train arrives as another is preparing to depart across the platform, leading to collision between riders on access stairs. Some new stairways have been constructed, but most are still gated shut, not ready to open. Escalators exist, but often are running the wrong way or are stopped; not infrequently, riders who find an escalator running the "wrong way" hit the emergency stop button, violating signs warning against the practice. Amtrak operates the station, which has undergone demolition, underground rebirth, upgrading and modernization since it opened in 1911, but the track and platform layout remains basically unchanged: 21 tracks shared by NJT, Amtrak, and the Long Island Rail Road. The passenger load has increased enormously since the station opened more than 100 years ago, but no new tracks have been built. In contrast, Grand Central Terminal across town, which opened in the same era, was built with 67 tracks and has plenty of capacity. What can be done to ease the crush? Building new tracks would take decades and may never happen. Why do the escalators run the wrong way? NJT, in a familiar refrain, blames Amtrak for last-minute track assignment changes, perhaps due to a train with mechanical problems, or maybe a sick passenger. The new stairways will open, eventually. For now, riders can only grin and bear it, and factor the additional time into their trip planning. NJ Transit has announced that substitute buses will begin operation on weekends on the Gladstone Branch between Summit and Gladstone, effective Sunday, March 19 and continuing until some time in the fall. This substitution has become an almost-annual event and allows work on the railroad track and overhead wires; a major part of the work is the replacement of the original wooden poles that support the overhead wires with more permanent steel supports. New paper timetables for the revised service are available. Inbound travelers will find two bus services, one serving Murray Hill and New Providence, and the other serving all other stops. (It is unclear how passengers boarding at outlying stations who want to travel to Murray Hill or New Providence would be accommodated, but bus drivers have usually been accommodating to special needs; the bus from Gladstone passes by the New Providence station, and at Murray Hill the driver will probably drop passengers on request on Springfield Avenue, albeit some distance from the Murray Hill rail station.) Note that inbound departure times are typically some time earlier than the regular train departure times, and that bus stops are in some cases several blocks from the rail station. A description of the service, including a list of the bus stops, can be found here. The bus service will also operate on holidays, except that a special train service will operate on Tuesday, July 4, and on October 21 for the Far Hills Steeplechase event. NJT also announced that midday bus substitution will be in effect on weekdays from July 10 through August 31; this has also been the custom in recent years. Do Uber and Lyft Threaten Transit? We need more transit infrastructure, riders and advocates say. All our transportation facilities are overloaded. There's not an empty seat to be had, at least in peak hours. But is this really true? Have a look at the automobiles traveling across the Hudson River, or on any street in Manhattan. Sure, the roads are clogged; but look closer: there are lots of empty seats in those vehicles. Enter the smart-app ride-hailing services Uber and Lyft, which mobilize once-private vehicles to fill some of those empty seats and provide an increasingly-popular transportation alternative. How many riders may have been diverted from suburban transportation networks such as NJ Transit remains unknown, but according to reporting by Emma G. Fitzsimmons and Winnie Hu in the New York Times (March 7), the ride-sharing services may already be cutting into ridership on New York City's transit system; and riders switching to the cars have their reasons. First, there's the price. Medallion taxis in New York City are convenient, if you can find one, but they can be pricey. The price of a ride using a car-pool service can be as low as five dollars, more than the $2.75 base fare of the transit system (and a lot more if the customer already has an unlimited-ride transit subscription), but potentially much more convenient: door-to-door, quiet, no stairs to climb, and with a guaranteed, upholstered seat. The result has been burgeoning patronage of the ride-sharing services. Meanwhile, the number of taxi rides has been falling, and with it, the price of the once-sky-high "medallion" that allows operation of a stop-on-hail taxi in the city's monopoly system. (Declining taxi patronage also hits the transit system, as transit operator MTA collects a 50-cent surcharge on each taxi trip.) And recently it was disclosed that ridership on the city's subway system has declined for the first time since 2009. Since then, transportation demand has increased markedly, and most of the demand has been satisfied by the city's subways and buses. Most of the city's rapid transit system is decades old and, with new investment rare, the result has been that "It's hit a point where people are choosing to travel by ride-hailing because the subways have become intolerable," according to Thomas K. Wright, president of the Regional Plan Association. The Times illustrated its article with photos of jam-packed subway platforms, with clearly worried customers trying to find a way through the crush. Riders who could say they can't afford taxis will spring for a shared-car ride, typically costing $5 for a trip anywhere in Manhattan. Late at night, when plenty of seats are available on the subways, riders may still call a car for faster and safer service, rather than wait 20 minutes for a train on a deserted platform. Five months after a fatal train crash severely damaged NJ Transit's busy Hoboken terminal, there is still no prediction as to when the terminal will fully reopen, according to reporting by Larry Higgs for NJ Advance Media. The crash damaged canopies over the pedestrian walkway at the end of the tracks, closing tracks 5 and 6 and separating access to tracks 1 through 4 from the rest of the terminal. It also requires riders to and from the higher-numbered tracks to take a circuitous detour through the main waiting room to reach the streets of Hoboken, the local bus terminal, and the PATH train station. NJT spokesman Jim Smith declined to predict when the historic terminal would fully reopen, saying only that "the work has to be approved by many regulators and done with safety in the forefront." Federal investigators have yet to release a report on the cause of the accident, in which an inbound train failed to stop at the bumper and continued across the pedestrian walkway, stopping only after impacting the terminal structure itself. A pedestrian died in the incident, and numerous passengers on the train were injured. Transportation advocates are largely convinced that massive investment in the area's infrastructure will be essential to cope with increasing demand and aging in-place facilities. But even when transit agencies try to move ahead with improvements, they often run into opposition from communities which fear adverse effects from the projects. Consider the Long Island Rail Road's plan to add a third track to its busy main line from Floral Park -- where the existing four-track line ends -- to Hicksville, where the line divides into two two-track branches. The ten-mile bottleneck has been in place for a century, yet in that period Long Island has changed from a sleepy agricultural area to a burgeoning bedroom community in which tens of thousands of commuters depend on the railroad to get to work. Improvements allowing use of the two tracks in either direction have helped, but demand continues to outpace capacity; thus, the plan for a third track to handle what has become 107,000 passengers each weekday on the line. But according to reporting by Joseph De Avila in the Wall Street Journal (Feb. 14), towns along the line are reacting negatively to the proposal, and the years of disruption that the project would entail. Mayors of online communities Garden City and Mineola argue that the demand can be satisfied without adding a third track, and residents say the benefits won't be worth the "headaches that construction would cause." And Floral Park's mayor questions whether the estimated three-to-four-year construction period is realistic. On the other hand, businesses, construction companies, and real-estate interests, predictably, endorse the plan.